Two friends, Normichi (Masaki Suda) and Yusuke (Mamoru Miyano) are confounded by a pair of mysteries. 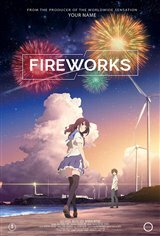 The first, whether fireworks are flat or round when they explode and the second, their growing feelings towards female friend Nazuna (Suzu Hirose). Unbeknownst to the others, Nazuna's parents are amidst a divorce that threatens to take her away after summer break, but when the boys compete in a swimming race, she hatches a plan - to run away and elope with the winner! In this story of summer, the season of youthful discovery, can these three find the answers both their heads and hearts seek?